Our relationship with Grandparents is precious. Time shared between grandparents and grandkids is especially magical. A visit with Grandma and /or Grandpa is the perfect time to bring the Love Shaker into every activity. Sprinkle the card deck or board before a game with LOVE. Add LOVE to the pancakes for breakfast. Shake love on your favorite teams as they play the game. My Dad calls himself a big kid now… after turning 80, he says it’s like opening to the world with the wonder of a child again! As we grow older, life can become a bit slower and simplified. We understand what really has meaning… like being with those we LOVE. The Love Shaker can be a simple way to display that Love we want to share even when we don’t have words. There is such joy adding LOVE to every activity with the Love Shaker. Grandchildren bond and connection to Grandparents with a shake or two of LOVE. Bless the home of your beloved elder as they downsize into a new home. Shake Love on them while Skyping… they’ll feel the long distance LOVE. Tuck ’em in for a restful nap with LOVE on the pillow. 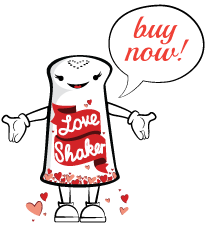 The Love Shaker can be at their bedside as a reminder of your LOVE. There are so many ways to LOVE our Folks!